The widow of NFL center Grant Feasel is sharing her family’s story to help warn others about the dangers of sports-related concussions. 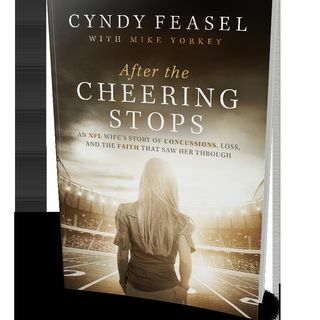 Cyndy Feasel lost her husband Grant in 2012 to cirrohsis of the liver due to alcoholism, which was connected to a degenerative brain disease called CTE. The CTE in turn was caused by a lifetime of receiving concussions from playing football. The couple, which had three children, divorced about a year before Grant’s death, ending 29 years of marriage. They made peace shortly before his death. “If I’d only known that what I loved the most would end up killing me and taking away everything I loved, I would have never done it,” Grant told Cyndy weeks before his death. Cyndy calls Grant’s issues a “slow fade.” She did not realize the extent of his brain injuries until his death; CTE can only be diagnosed by performing an autopsy on the brain, she said. The damage happened over the course of his lifetime of playing football. To understand their marriage, you have to start at the beginning of their relationship, she told me. They met while attending Abilene Christian University — he was a Southern California guy on a full football scholarship and she was a Texas gal. Their first date was a blind date, but she had already seen him around campus. At 6 feet, 7 inches, he was the tallest man she had ever met — and handsome. The two Christians had a great deal in common. Grant loved poetry, music and art. She had never known another guy on a first date to be into those things. Grant was a gifted football player — and extremely intelligent. He won every academic award and was an academic All-American. He was accepted into every dental school in Texas but chose to put off a medical or dental education to play football. He was drafted by the Colts. Cyndy calls those the good years. They traveled a lot and met lots of people. Grant worked hard and she was a stay-at-home wife. However, even before then, she worried about the physical toll the game took on Grant. He had a concussion in his senior year of college. He blew it off. That served as a red flag to Cyndy, whose sister had fractured her skull in a serious fall. But people didn’t really talk about concussions at the time. Grant would later suffer another serious concussion within the last five years of his NFL career during a game at Mile High Stadium in Denver. He went back into that game despite experiencing tunnel vision. Other symptoms included nausea and head pain. However, there was no sports concussion protocol in the 1980s and 1990s. I asked Cyndy if pro sports organizations are doing better about dealing with concussions. Grant’s brain was “jiggled” around in every play every day from age 8 to age 32. Cyndy said she posts frequently on her Facebook author page about the dangers of concussions. She calls her marriage a “tragic love story” similar to Romeo and Juliet. She and Grant drifted apart. Cyndy also says that Grant’s condition was a “slow fade.” She thought he was simply fighting drug and alcohol addictions, which is why he started making irrational decisions like continuing to play after nearly dying of a serious staph infection. Even though he had a port that allowed antibiotics to be delivered to his heart, Grant continued to play football. After that, Grant began bringing in bags of unmarked pills and drinking liquor with sodas. Candy later learned that sleeplessness and alcoholism are signs of CTE. The night that he did retire, Grant drank an entire bottle of whiskey of a leading brand. “He loved our family and he loved me. But … he had a constant drive.” That night he gave Cyndy an expensive ring as a gift — the same exact ring he had given her two years prior, and he did not remember when she reminded him. Cyndy began finding bottles of alcohol hidden in his clothes at home. She wishes now that she had chosen one person in whom to confide, but she says she was a co-dependent bent on not sharing her marriage’s problems. “Please tell one person” if you are going through a similar problem, she urged. That person can be a lifeline to get you help somewhere. Grant always had ongoing prescriptions for pain killers for various hurts but only had one surgery, to fix a broken nose. He never had knee replacement or had his hurt back fixed. Cyndy said she always believed her old Grant, her children’s father, would return. He never did. She said she did not know about the CTE for sure until after his brain was examined after death. Toward the end of his life, he had begun to suspect he had CTE like certain other athletes who had been diagnosed with it. That’s when he said he would never have played football if he had known it would kill him. There are four stages of CTE. Grant had Stage 3, Cyndy said. She said she considered suicide after Grant’s death. Her faith, and her family and Christian family, have carried her through with their unconditional love. God is her answer. “I wouldn’t be here without my faith,” she said. Christian therapy and a church support group have also helped. “If you’re going through anything like this you can’t do it alone.” She said she was a “terrible co-dependent” and pretended she had a perfect life. “I believe in the Bible,” she said. “I believe that God knew everything about me before I was born and knew about Grant.” She believes Grant is in Heaven saying “You go girl!” about her sharing her family’s story. She and Grant reconciled at the end. But before that, “we ended when I was mad, sad and angry. It was a very tragic ending.” Forgiving one another before Grant’s death was the only way she has been able to carry on, she said. Cyndy said she is honoring her husband’s legacy by sharing his story. More information about Cyndy and her story is at afterthecheeringstops.com and cyndyfeasel.com. Look up her name on Facebook for her author page. She has resources for people to learn more about CTE and brain research. She belongs to a group called Save Your Brain for family of CTE victims. She did not have that resource when going through Grant’s health struggles. She also recommends looking up CTE on the Mayo Clinic and Centers for Disease Control websites. “This is a disease that affects not only NFL athletes but children,” she said.